Fog has always been a disturbance to aviation. Canceled flights, delayed landings, and of course, plane crashes have on many occasions been attributed to fog. No matter how sophisticated the airplane’s landing infrastructure is, without the pilot’s ability to see through the windscreen, effecting a safe landing never really comes easy. At a point in World War II, air forces on all sides of the war could attest to facing the common challenge of visibility. 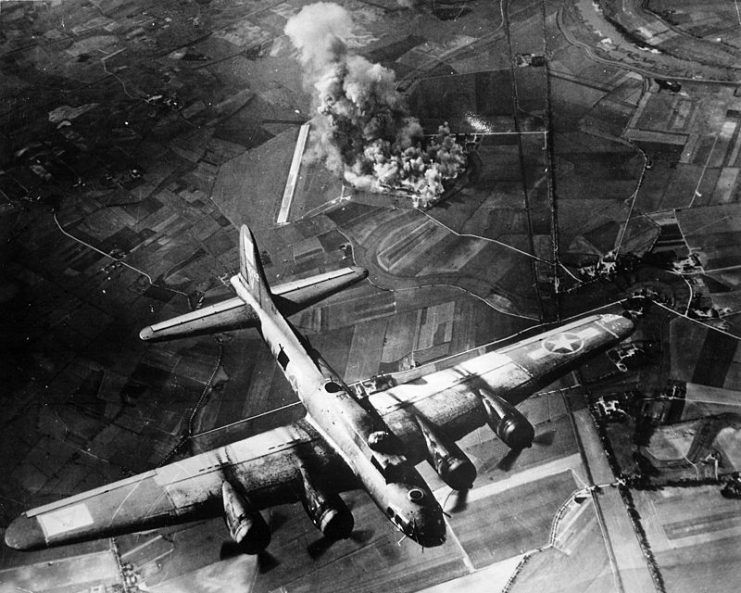 On several occasions, aerial operations were aborted due to the fact that the view of the target from above was not clear enough. Since many air raids took place at night or in the early morning, it was common for aviators to meet thick fog over target zones and landing strips. Indeed, nature was a neutral enemy which battled all sides in the war. The British Royal Air Force (RAF) was particularly concerned about the hampering effects of fog on their operations. The RAF lost several aircraft during operations owing to lack of visibility. With vast areas of the United Kingdom submerged under thick curtains of fog, pilots were having horrible landing experiences. When unable to land due to fog, pilots would be instructed to point their aircraft towards the sea. As the planes got close to the coast, the crew would bail out and the now unmanned plane would crash into the sea. This was a frequent issue for the RAF, and because each bombing mission usually involved hundreds of aircraft, a sizeable percentage of the aircraft ended up in the sea. Naturally, the RAF began looking for a solution. 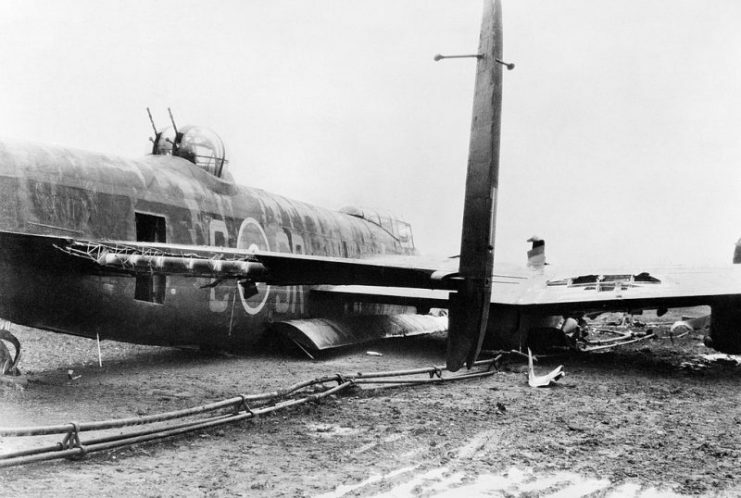 Damaged Avro Lancaster of No. 101 Squadron RAF (identified by squadron code SR on fuselage) at Ludford Magna, Lincolnshire, after a successful crash-landing on returning from a raid to Augsburg on the night of 25/26 February 1944. In the 1930’s, an engineer named Henry Gareth Houghton had embarked on a quest to use scientific innovations to modify weather, believing that overcoming the menace of fog would be a landmark breakthrough for mankind. In 1934 he demonstrated the possibility of combating fog. In his demonstration, he successfully dispersed sheets of fog by spraying the misty air with calcium chloride. He fitted a set of spraying nozzles on a 100-foot long pipe which was suspended 30 feet above the ground. When the fog came, the apparatus sprayed the fog with calcium chloride at a rate of 2.5 gallons per second. Within 3 minutes, the area which had been visible from less than 500 feet away was made visible from over 1,320 feet away. Avro Lancaster B Mark I, ME590 ‘SR-C’, of No. 101 Squadron RAF, lies on the FIDO pipework at Ludford Magna, Lincolnshire, after a successful crash-landing on returning from a raid to Augsburg, February 1944. Although the method was successful, implementing it was commercially infeasible. To be implemented in commercial airports, outrageously vast amounts of calcium chloride would be needed. Moreover, calcium chloride has corrosive properties which makes it unsafe to use around aircraft. In the early 1940s, it became clear that the only practicable method for the large-scale dispersion of fog at airfields was heat. Thus began efforts to develop mechanisms that could use heat to that effect. 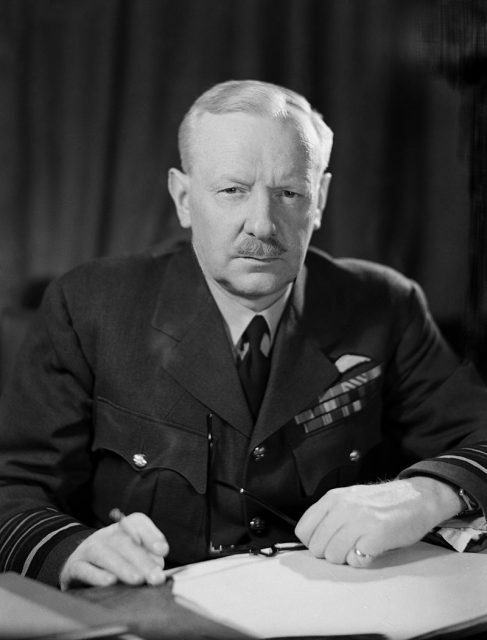 At the request of Air Chief Marshal Sir Arthur Harris, the Petroleum Warfare Department under the leadership of Engineer Arthur Hartley embarked on a project to develop an instrument that would defeat fog. This gave rise to FIDO, an acronym for Fog Investigation and Dispersal Operation, or alternately, Fog Investigation and Dispersal Of. The FIDO system comprised a pair of pipes positioned horizontally on each side of the runway. 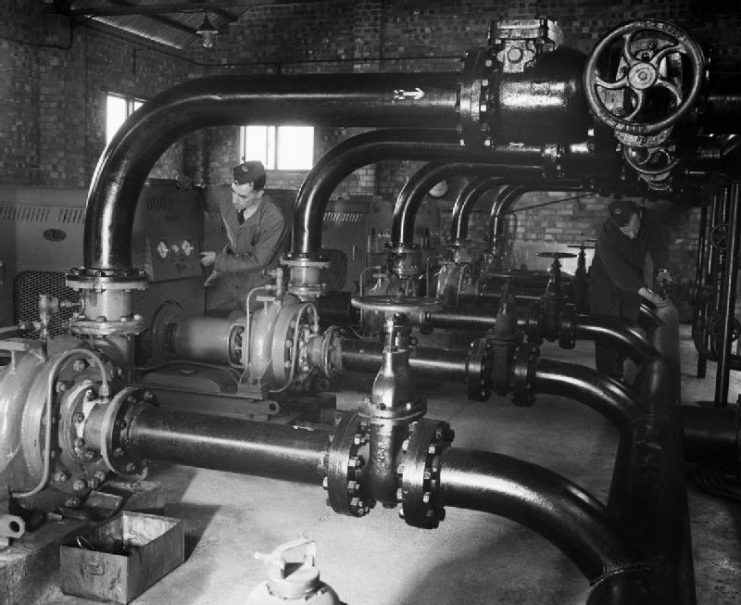 The pipes had burner jets fixed at short intervals along them. When fog was present and a landing was about to happen at the airstrip, the aerodrome’s ground personnel would activate the FIDO system. Fuel would rush through the pipeline and would get sprayed through the burner jets. A torch would then be used to light the spray so that the burner jets would shoot the flames upwards. The heat generated by the bright flames would disperse the fog in minutes. The first experiment with the FIDO system occurred on November 4, 1942, in Moody Down, Hampshire. It successfully cleared 200 yards of fog up to 80 feet above the ground. FIDO at Graveley, Huntingdonshire, as an Avro Lancaster of No. 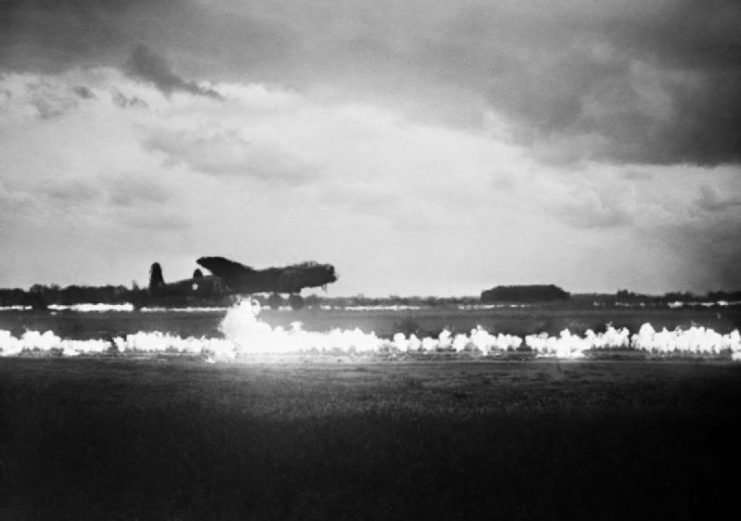 35 Squadron RAF takes off in deteriorating weather, 28 May 1945. Soon after, large-scale FIDO systems began to be implemented. These large-scale systems routinely dispersed fog up to several hundred feet above the ground. The bright yellow flames of the FIDO systems could be seen from several kilometers away, dancing in the breeze. The first of these full-scale FIDO systems was set up in January 1943. 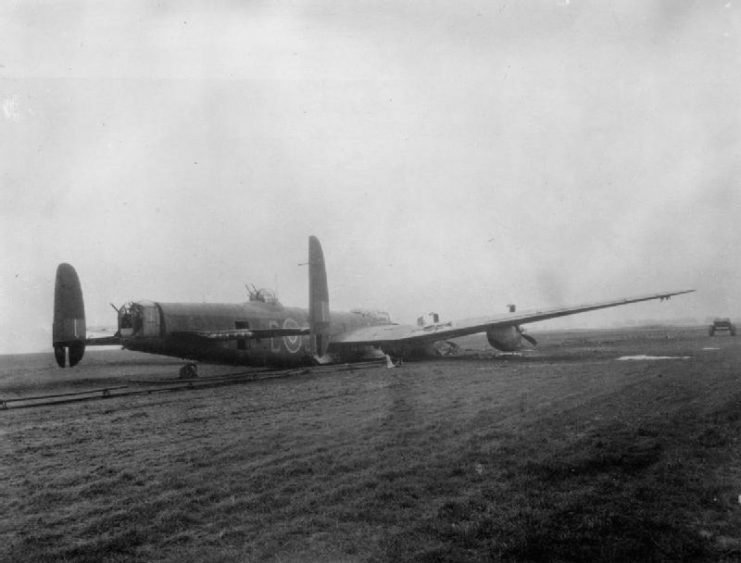 After it was installed, a bomber reportedly piloted by Air Vice Marshall DCT Bennet successfully landed on the blazing runway, unhindered by fog. FIDO became fully operational by November 1943 and helped make a turning point in the war. 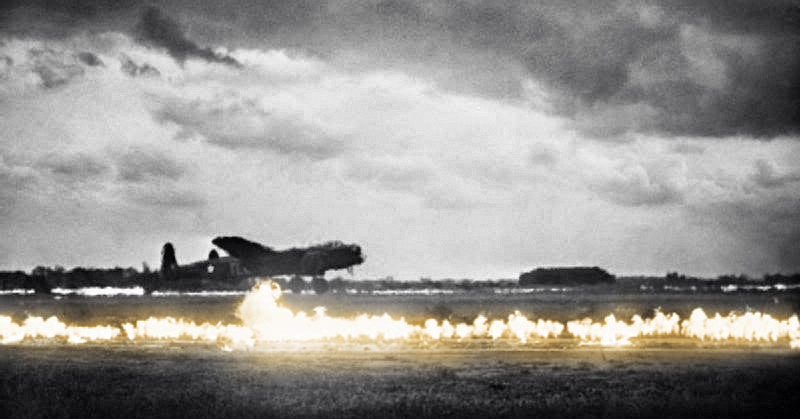 Over 2,500 Allied aircraft successfully operated from over 15 fog-covered airbases all over Britain. The Battle of Bulge began in December 1944 while the whole of Europe was subjected to extremely dense fog. During this period, the FIDO system came in very handy in allowing airplanes to take off and land with minimal visibility challenges. Sulzer pumps installed at RAF Graveley, Huntingdonshire, to supply the FIDO (Fog Investigation and Dispersal Operation) petrol pipes on either side of the main runway. One thing that plagued the system, however, was its cost of operation. FIDO systems consumed as much as 100,000 gallons of fuel per hour. However, the high costs of FIDO proved to be ultimately a gain since it reduced the numbers of aircraft lost due to fog during the war. FIDO systems could not be implemented in commercial airports for obvious reasons. Nevertheless, modern aircraft can successfully land with practically no visibility owing to innovations such as radar and GPS technologies. Despite the efficiency of these innovations, flights continue to get canceled and landings continue to get delayed. Indeed, fog is still one of aviation’s worst headaches.